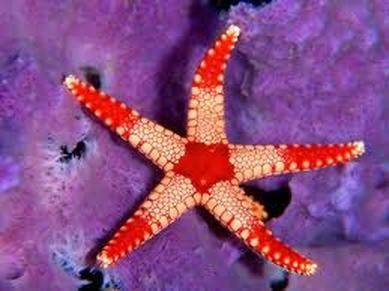 There are over 2,000 species of sea stars. Eat mussels, clams, small fish, snails, barnacles, limpets, sponges and sea anemones. 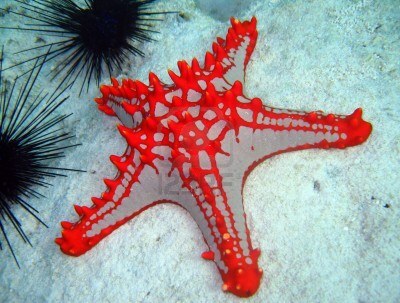 Are also known as star fish, but this is incorrect as they are not fish. Can be found in warm and cool regions and are present in all the oceans. The number of arms on a sea star can vary - the majority will have five arms located evenly around the body and some may have many more - the sun star has up to 40 arms. Can regenerate a lost arm. Can be found in a variety of colours, shapes and sizes. Do not have gills, scales or fins. Have poor eyesight, but they do have an eye spot at the end of each arm, sensing mainly light and dark. The main predators are birds, sea otters and human beings. Some live in small groups.